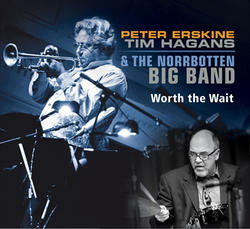 "Worth The Wait" reunites drummer Peter Erskine with trumpeter Tim Hagans. Erskine and Hagans both shared the stage in the early 70's with the great Stan Kenton & his Orchestra. Hagans is currently the artistic director for the Swedish Norrbotten Big Band. The band's mission is to perform original music with incredible soloists. On This recording they have that with the great Peter Erskine. After a long absence from performing together in the big band setting, Erskine and Hagans are back together again playing their own music, and with one listen to this incredible new recording you will hear if for yourself.